Frankenstein slot is a NetEnt based casino slot game. This is a 5 reels and 20 paylines game, which offers a jackpot of 1500 times of your total bet. The return of the player percentage i.e. RTP of this game is 96.7. 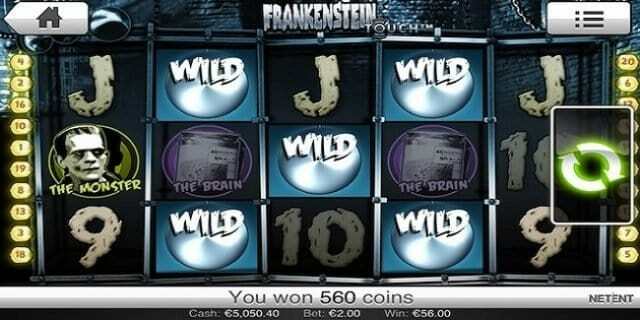 Frankenstein slot is inspired by Mary Shelley famous novel. The game can be played at Net Entrainment casino sites. Total six basic options can be used here to play the game including “Circular arrow button”. The first option is “Coin Value” which is being used to change the coin denomination and then comes “Lines” which is used to select the number of active paylines, then comes “Level” which s used to pick the number of coins wagered each line. “Circular Arrow Button” is used to sin the reels at the chosen bet, “Max bet” option is used to play the game for the highest coins size and “Auto Play” option is used to play the game without any interruption. Total 5 reels and 20 paylines available in this game. Minimum coins per line are 1, while maximum is 10. Minimum coins size is 0.01, and max coins size is 0.5. Jackpot is 1500 hundreds times total bet. Windmills are the scatter here and if you hit 3 or more windmills at once, you will trigger free spin feature. During free spin feature, addition free spins can be triggered. This is one of the most popular and most played video slots presented by NetEnt casino software. Brave players from across the world can win huge real money here at this place.